Chosen Payments is proud to be featured in the April 2016 issue of Business Solutions Magazine. The nationally distributed B2B magazine is dedicated to educating IT resellers in a variety of markets including credit card processors, managed service providers, software developers and integrators. Chosen Payments was presented with a unique challenge of providing a point-of-sale solution for a luxury auto spa doing business inside a Los Angeles Four Seasons Hotel. The Chosen Payments solution had to integrate into the hotel’s computer system to pass through guest transactions originating from the auto spa, Levaggio. Levaggio also wanted the ability to process transactions from mobile devices that would simultaneously update across all platforms. While it was a challenge, Chosen Payments met the needs as a partner in success and developed a system that met the needs of the client, the hotel and their respective customers through an innovative and creative solution worthy of national attention in Business Solutions Magazine. "Thank you very much for taking the time to assist me with this (fraud) issue! Your help and assistance are greatly appreciated. We thank you for all you do our industry! We are so blessed to have you on our side." Khider Ahmim - Mediterranean Limousine, Inc.
"Thank you for great customer service ... probably the best I have ever received on a call like this. Thank you for your friendliness. We are all set now." "Thank you so much!! What responsive and professional service!! Everything I needed was taken care of in a matter of an hour!! Incredible service. Thank you.."
"I can't stop saying this....but, thank you! I ran credit cards this weekend and Monday morning the money is in my account. It's amazing! I don't know how to thanks you guys. You work so hard and now I'm finally seeing more money in my bank account! My bills are getting paid on time again too. You gu"
"I wanted to thank you all, especially Talia, for "holding my hand" to set up & process transactions seamlessly during our off-site event. How wonderful to have a knowledgeable, patient human being to talk to! " "Sending a huge thanks to Jim Luff for helping us come back to Chosen Payments. We are back with Chosen Payments as the service and the savings are clear!" "Thanks so much Michael! It's wonderful to have a human to connect to in order to help figure this credit card stuff out and one who has our back!" "I referred my client, 7 Artists Gallery to Chosen Payments. I helped her set up her terminal and worked with Loren. She was friendly, extremely patient and knowledgeable. The system is up and running with another satisfied Chosen Payments client! Congratulations on having a wonderful staff! " "Chosen Payments got to my attention because they were referred to me and vetted by Gourmet Catalog. They’ve lowered my rate significantly and my money shows up in my account much faster. Instead of the faceless company I was working with, I now have a representative." "I love the work that you and your Chosen Team have proven time and time again that you all are committed to our industry and your clients. You guys rock as our credit card processor!" "After years of bouncing around I finally found the right processor for me. The staff at Chosen Payments actually care!" "Brad asked me to trust him so I did, and I must say I am saving more money than promised. I am glad I gave them a chance." "Great service and helping me grow my store, are the major reasons for signing up with you. So far so good and I like the I Phone deal!" "Chosen Payments has been aggressive in saving our Members money with their credit card processing capabilities and are a very active company in our Industry. We are excited to have them as a Preferred Partner who will add value to the National Limousine Association and our Members"
"In 27 years of business I only had 2 credit card processors. My final choice was to go with Chosen Payments. They stand behind what they say 100%. Oh yeah, saving money was also a smart business decision." 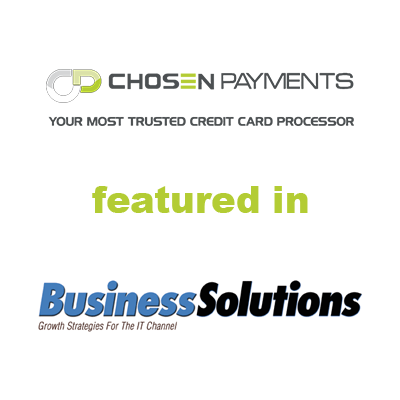 Arthur Messina - Create-A-Card, Inc.
"Chosen Payments has been our processor for the past 2 years. They have been active with our account from day one. Always looking to save our company money with new programs available to the industry. I have been in business for over 18 years and in this time I have never had a processor stay so acti"
"As a new business owner and having so many things on my plate, credit card processing was definitely one that I was not looking forward to dealing with. However luckily I was introduced to Chosen Payments who made this process as painless as possible for a new business owner. Not only have they addr"
"I get calls 3 or 4 times per day from credit card processing companies trying to earn my business and never would I leave Michael Lepore and Chosen Payments. They have treated me better than any processor I had in the past and their company has a great presence in our industry. Not to mention they h"
"After working with URA's Processing consultant to design just the right program for URA members, I can honestly say that they are professional, committed to service and reliable. I'm convinced that using Chosen Payments will save every member the cost of their annual URA dues and more!" "Since working with Chosen Payments I've experienced their service, support and savings first hand, and that's why I'm happy to be able to recommend them to you as a cost-effective, reliable solution for your payment processing needs." "We have been with Chosen Payments for over a year and can say that they deliver what they promise. They not only saved us close to $2800 but their support has been top notch. I would recommend speaking with Michael Lepore, our dedicated consultant and let him prove to you their level of commitment. " "Their experience and dedication to the industry will greatly increase the value to our customers"
"We have been using this company for all of our merchant services. I met one of their representatives at a GCLA meeting here in Los Angeles and the rest was history. Not only are they credible and reliable, I get the best rates anywhere. My account manager Adam Yaras, constantly strives to make sure "
"Nobody has ever taken care of my credit card processing like Chosen Payments. I slapped myself for not using them years ago. I am saving a TON of money!" "When it came time to look at our account the relationship with Chosen Payments would work better as far as the fees, customer service, responsiveness and basically the whole thing. We like to know that we can speak to a live person and have someone to call and talk to and we get that with Chosen Pay"
I have been working with Vanessa. I would like to let you know what an amazing job she did. I feel like she went above and beyond for us. Due to her help I am extremely happy with Chosen Payments. I can't state enough what a help she has been." "I just wanted to say that the Chosen Payments team is awesome! Thank you all for the great service!" "These guys provide 100% the best customer service in their industry and the rates are pretty darn good! Many perks to being affiliated with their company. Has proven to save us money year over year." "As a business owner in today's market, receiving payment via debit or credit card is pivotal to success, growth, and convenience. I've been solicited for YEARS to set up a merchant account by telephone solicitors. I wasn't about to sign up with someone who just called me from reading my name/numbe"
"I have been using this company for all my merchant services. Not only are they credible and reliable, I get the best rates in town. My account manager Jeff Brodsly, constantly strives to make sure we are taken care of and happy with their services. The staff at Chosen Payments are attentive and und"
"I've wanted to get up to speed with these Iphone card swiper deals for a while now. My old company didn't have them and in order to get them I'd have to use a 3rd party that was going to charge me $75 a month. So i asked a friend that was already using them who their merchant service people were. " "These days most banking and credit card processors are so large and impersonal, it can be very frustrating to get anything done. Chosen Payments is the exception! They work with you one-on-one. I know my rep's name and the tech guys name and they recognize me when I call. Opening an account was easy"
"Chosen Payments has proven to be a most professional, honest and customer-driven company. The process of changing to Chosen Payments was seamless and we are saving a lot of money. Jeff Brodsly is always available and a great advocate for our industry. I highly recommend Chosen Payments"
"Our experience with Jeff Brodsly and Sarah VanBeek has been very positive. They are a great team whose insight has saved our members money and our organization time and effort. Their creative solutions and incentives make our organization more attractive to potential members. We are proud of our rel"
"Thank you Chosen Payments for exceeding my expectations! This level of customer service is very rare these days and I appreciate it." "I have been using this company for all my merchant services. Not only are they credible and reliable, I get the best rates in town. The staff at Chosen Payments are attentive and understanding. I have contacted them several times with mundane questions, and as I would expect the staff there to get f"
I get a quick response. I will continue"
" would like to say that Alexandria is one of the most professional vendors that I have business dealings with. She has gone above and beyond for my company and I. What separates Alexandria from her competition, is that she takes the extra step to make sure that her customers are 100% satisfied with "
"Over many years I have utilized the services of different merchant services. Most recently I moved my account from Wells Fargo to Chosen Payments. The service I receive from my rep, Alexandria Scalesse is far and away better than any other company I've worked with. Costs in this business is very com"
"I couldn't be happier with the service and support we have received from Chosen Payments. Alexandria walked us through every step of the process and really made my life easy. Her work ethic and attention to detail is very impressive. Chosen Payments must also be a great place to work, because Alex i"
"While we were a bit hesitant to switch over from our old provider of the last 5 years (who we liked), Merchant Account Executive Rob Crowell at Chosen Payments made the transition absolutely painless and hassle-free. He's always available for questions and counsel, should we need him. It's been a se"
"We have had a great experience with Chosen Payments and Johanna’s kind and friendly customer service. They provided us with excellent fee rates plus the process to switch over was very easy. I am happy to recommend her company to anyone!" "Just as we don't want our clients to not continue using our services we almost never change firms with which we are doing business as we value long term familiar relationships. However, almost on a fluke, based on a change in another business relationship, we accepted Chosen Payments offer to provid"
"If you have a small company and need to take credit cards every nickel saved helps! This company offers several options making them the best choice for my type of business. They have more to offer than I have been able to use at this time but their customer service and contact is excellent. Looking "
"Interestingly, Chosen Payments came knocking on my door by way of a cold call a few months ago. The rates sounded good and I kept listening. I'm glad I did. I've experienced nothing short of incredible customer service from my account manager, Rob. I'm extremely happy with my decision to have Chosen"
"I switched to Chosen Payments for my credit/debit card processing a few months ago and it was a great move for me and my company. With my previous processing company I had 9 deposits going into my account each day which made for a bit of a nightmare when it was time to balance my checking account ea"
"I had everything explained to me and now I understand my account. I'm glad we can also save more of our money too." "Johanna was a pleasure to work with. She made the transfer from another company to Chosen Payments an ease. Their e-payments make it easier to track our transactions. I would highly recommend them to any company!" "Thank u very much! Muy feliz por el dinero que ahore. Y los precios son muy bajos. Mejor servicio que la compania antes." "Just joined CP!!! Katie was very professional, personable and easy to talk to. I would recommend chosen payments for anyone looking for a merchant service. Thank you for the easy breezy experience!!!" "Fantastic group to work with! My transition was flawless, and I'm now saving money! Thank you Chosen Paymrnts"
"We are very pleased at the personal and professional service we have received as a new customer!" "Awesome people to work with. Best customer service there is." "Top notch service!! The whole chosen staff is dedicated to their clients and their satisfaction." "Steve Walsh is the absolute best Account Executive on earth. And Jeff is and exceptional business man that will do you right always!" "The customer service is outstanding and I can always count on Michael Lepore to check in on our office and provide great solutions to our needs." "World class products, solutions, and support. #1 in the industry." Have questions? Give us a ring or fill out the quick contact form and a Chosen Payments representative will be happy to assist. Chosen Payments is a registered ISO of Wells Fargo Bank, N.A., Concord, CA.